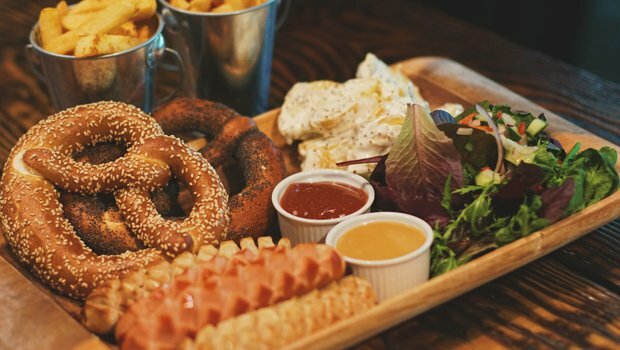 These family-friendly and child-friendly eateries in Glasgow are great for parents and their entourage, there's an excellent chance of **whisper it** ice cream too. Germanic bar and restaurant overlooking the indoor ski slope, with a fine selection of Bavarian beers, and plenty for kids. A bustling Dennistoun café-diner, popular with locals and families, offering Italian favourites, a chip shop and well-stocked deli. Large restaurant serving gourmet kebabs that bring the spirit of Central Europe to Glasgow. Brightly lit, colourful, US-themed joint, with an immense variety of burgers, sides and milkshakes at very fair prices. Large, bustling café beneath Kelvingrove Art Gallery and Museum, popular with art-lovers, tourists and families. Hip pizza joint from the A'Challtainn team in Barras Art and Design, with plenty of space for young ones. Hip pizza joint in BAaD – bringing art and food together in the heart of the Barras. A bustling Dennistoun treat, all decked out in blue and gold with crystal chandeliers, tempting chip shop and well-stocked deli.